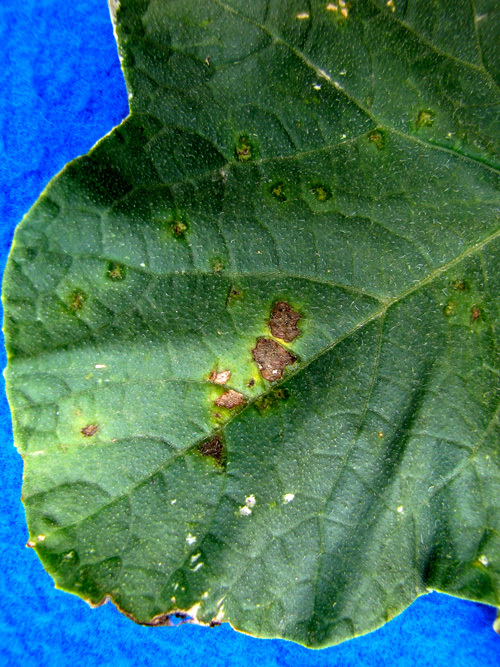 Downy mildew causes angular, yellow to brown lesions on top of the leaves that are restricted by leaf veins. When conditions are favorable, for example early in the morning when moisture is higher, lesions observed on the underside of the leaf may be covered in dark “down”. This downy growth is masses of pathogen spores called sporangia, which can be seen in the field with a 20X hand lens. In the presence of water sporangia can directly germinate or differentiate into swimming zoospores that infect leaves. 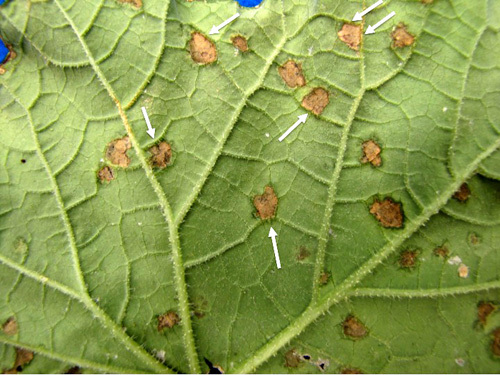 Identification of downy mildew in cucumber can generally be done in a field setting due to the characteristic angular lesions and pathogen sporulation in the underside of the leaf. However, in crops such as watermelon and cantaloupe where lesions do not always have the characteristic angular shape, sporulation can be scarce and diagnostics can be more difficult. Figure 1. Initially spots are light yellow with a dark green border that appears water-soaked. The spots enlarge and become brown (necrotic). They are not angular like symptoms on cucumber and butternut squash. Image provided by Dr. Margaret McGrath, Vegetable Pathology, Cornell University. Figure 2. The spots enlarge and become brown (necrotic). They are not angular like symptoms on cucumber and butternut squash. Image provided by Dr. Margaret McGrath, Vegetable Pathology, Cornell University. Figure 3. Initially spots are light yellow with a dark green border that appears water-soaked. The spots enlarge and become brown (necrotic). They are not angular like symptoms on cucumber and butternut squash. Image provided by Dr. Margaret McGrath, Vegetable Pathology, Cornell University. Figure 4. 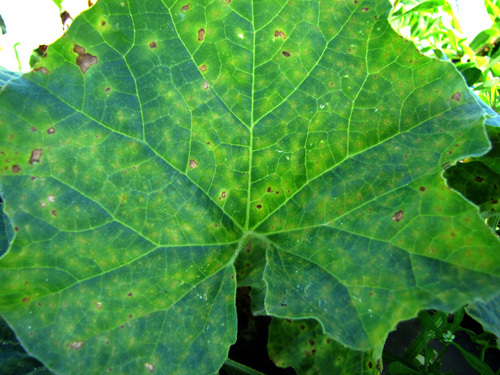 Upon close examination of some spots on the underside of leaves, it can be seen that major veins in the leaf form a barrier to expansion of downy mildew in this type of cucurbit as in others. Image provided by Dr. Margaret McGrath, Vegetable Pathology, Cornell University. Figure 5. 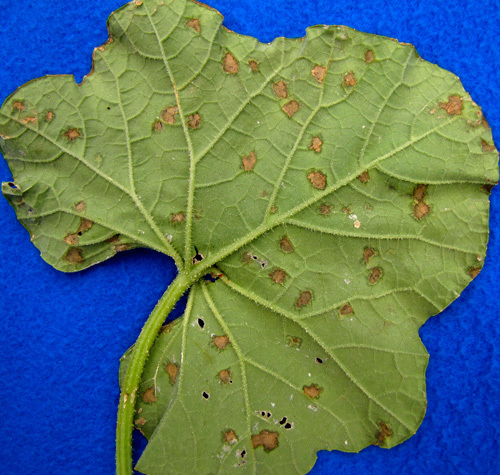 Upon close examination of some spots on the underside of leaves, it can be seen that major veins in the leaf form a barrier to expansion of downy mildew in this type of cucurbit as in others. The downy mildew pathogen does not produce many spores on cantaloupe leaves, thus the dark fuzzy (downy) fungal growth that commonly occurs on the underside of spots on cucumber and butternut squash leaves will not develop on these spots. Image provided by Dr. Margaret McGrath, Vegetable Pathology, Cornell University. Figure 6. 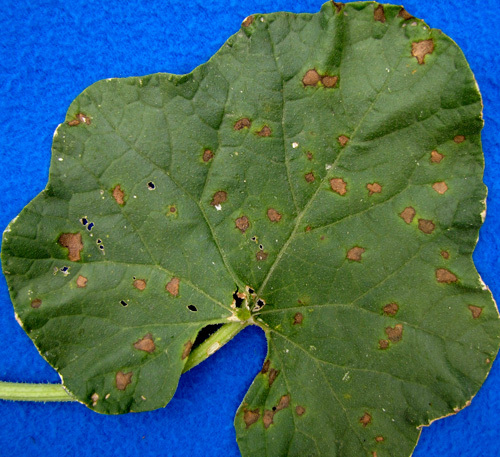 Upon close examination of some spots on the underside of leaves, it can be seen that major veins in the leaf form a barrier to expansion of downy mildew in this type of cucurbit as in others (see arrows). The downy mildew pathogen does not produce many spores on cantaloupe leaves, thus the dark fuzzy (downy) fungal growth that commonly occurs on the underside of spots on cucumber and butternut squash leaves will not develop on these spots. Image provided by Dr. Margaret McGrath, Vegetable Pathology, Cornell University.